Join YPT in Irkutsk as we head to the stunning early winter in Lake Baikal. We’ll be exploring the city of Irkutsk, Siberia’s second city after Vladivostok, and one with an amazing history and culture of St Petersburg exiles and local ethnic groups. We’ll be spending 3 nights in and around Lake Baikal, its various villages and islands, including a visit to Stalin’s ‘fish gulag’ at Peshchanaya village, and a bonfire meal and drinks with the local Shamanistic Buryat people! 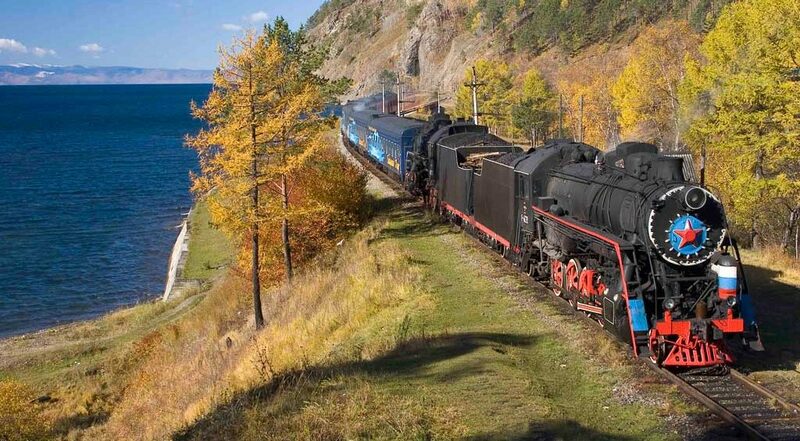 And we’ll spend a day at the Circum-Baikal railway, a 100-year-old railway that is a mix of pure engineering mastery and stunning scenery. This tour can be done as a standalone tour or it feeds into the Eurasian Adventure where you meet the rest of the group on the train in Irkutsk and travel on to Moscow. Meet your YPT guide and fellow travellers in our hotel for the beginning of our Siberian adventure. Walking Tour of Irkutsk city stopping by the 130th Quarter, we go to churches and monasteries, historical old wooden buildings, eternal flame, Karl Marx Street (main street of Irkutsk) and many other cool sites. At night, we head out for dinner and drinks to find out what goes for a night out in Russia’s Far East! Depart to the Raketa pier for a closer look at Lake Baikal. Head out by ferry to the Circum-Baikal Railway for an afternoon of exploration in this stunning landscape. Construction began in 1899 and the railway was finished in 1905. Myriad tunnels, bridges, viaducts and retaining walls and stunning scenery make this a site not to be missed. We’ll get great views from the boat, and can hike part of this 89-kilometre railway getting amazing photo opportunities. Dinner and a relatively early night in Irkutsk. Check in to our accommodation on the island. Visit Khuzhir village, the main settlement on the island and home to mostly Buryats, the native ethnic group. Stop by the Revyakin Museum and find out more about the Buryat’s Shamanism and the pipe-smoking on the island. Dinner and overnight in Khuzhir. Head out after breakfast up to the northernmost point of the island – Khoboy. We enjoy a traditional Buryat lunch cooked on an open fire of barbecued slated fish and ukha – traditional fisherman’s soup. After lunch we journey to Peschanskaya Village, an abandoned settlement and one of the most beautiful parts of the island. In Stalin’s time ‘enemies of the people’ were sent to work in this ‘fish gulag’. Head back to Khuzir and relax in a banya bath house (optional extra). Dinner and overnight in Khuzir, our last night on the island, we’ll keep warm with the help of an old friend – vodka! Free morning to relax and take in more of the scenery around the lake. Head back to Irkutsk via ferry and bus. Enjoy our last night in Irkutsk with dinner at the YPT friendly Tochka restaurant, we’ll have some well-deserved beers and more vodka is a certainty! Breakfast in the hotel and end of tour. Connecting flights/trains for onward travel, or join us on the mid-morning train to Moscow for the Eurasian Adventure! City tour of Irkutsk with its churches, museums, markets with of course a night on the town! Check out Peschanaya Village, an abandoned settlement and one of the most beautiful parts of the island. In Stalin’s time ‘enemies of the people’ were sent to work in this ‘fish gulag’. Enjoy a traditional Buryat (shamanistic ethnic group) lunch cooked on an open fire of barbecued slated fish and ukha – traditional fisherman’s soup.